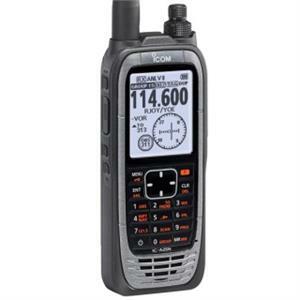 The IC-A25N VHF Airband Transceiver features a powerful six-watt transmitter with built-in GPS, Bluetooth®, and an IP57 waterproof rating. The simplified waypoint NAV feature guides pilots to their destination using the current position from GPS as well as from GLONASS and SBAS. The waypoint NAV feature has two functions: Direct-to NAV and Flight-plan NAV. In Direct-to NAV mode, the IC-A25N provides guidance to a specified waypoint; in Flight-plan NAV mode, pilots are guided through a series of sequential waypoints. The IC-A25N can store up to 10 flight plans and 300 waypoints. Position information imported from an Android™ or iOS™ device* can be used as a waypoint. With built-in Bluetooth, third-party wireless headsets provide convenient, hands-free operation; optionally, with the use of the VS-3 bluetooth headset, the side tone function can be used. A large 2350 mAh Li-ion battery provides operation times up to 10.5 hours. The easy to use interface combined with a large 2.3 inch display offers stress-free programming and in-flight operation. *The Flight Plans app for Android and iOS allows pilots to make flight plans and import them to the IC-A25N via Bluetooth. With the Flight Plans application, pilots can create a flight plan, set Direct-to NAV, display flight plan information, and display waypoint information. Also, the following VOR navigation functions are available: CDI (Course Deviation Indicator), OBS (Omni Bearing Selector), TO-FROM indicator, and ABSS (Automatic Bearing Set System). Free Shipping! * The ICOM A14, a Lithium Ion (Li-ion) is a powered air band transceiver and weather report (WX) receiver.